Year after year we always have given ourselves the personal goal to live the year to the fullest. 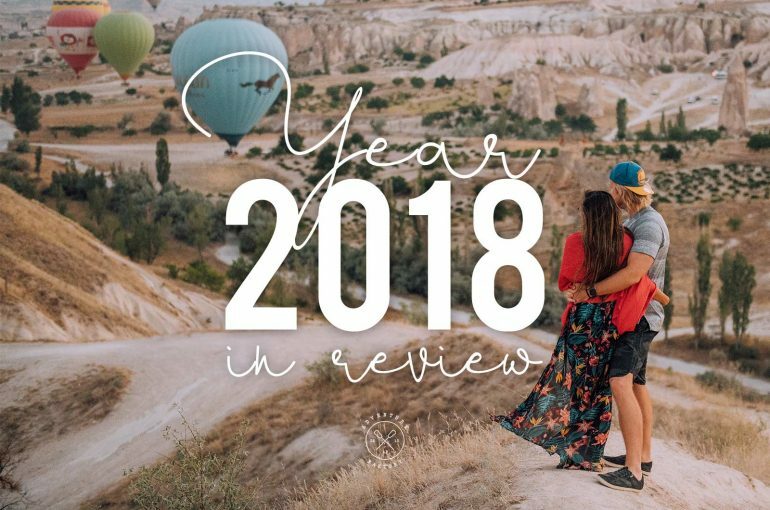 Travelling the world has always been what fulfilled our lives the most and 2018 was surely a year in which the did the most in our lives in terms of travel. It was first of all a milestone for Mitch to quit his full time job and join me in the world of digital work to sustain our travel lifestyle full time. Without dragging this introduction any longer, here is what we were up to in 2018. We started the year in Nepal after setting end of December 2017 a World Guinness Record of the “Highest Altitude Fitness Class” on Everest Base Camp, which we trekked without a guide and carrying all of our belongings by ourselves. It was such a great experience and we sure started the year in a positive note once we flew back home to Dubai. While Mitch was at work, I was sent to Saudi Arabia for photography assignment with CNN Travel. It was truly unique experience to be able to travel with a lovely friend Danae to one of the most closed countries for tourism, where we were both on the mission to cover the Camel Festival. Our highlight was to be able to see the beautiful Edge of the World a few hours away from the capital city of Riyadh. In February, Mitch & I had an urge to eat some local authentic Asian food. As much as Dubai is a culinary hub, we always feel the authenticity isn’t quite there. So just like that we booked ourselves a week in Bangkok, Thailand to just eat tons of street food. February was also the month we received an incredible coverage in Women’s & Men’s Health about our journey in Nepal. We are so grateful and are so happy to have had the opportunity to share that experience with the world. Then, just like that after 3 years, I realized my passport only had 2 pages left so it was an excuse to just go back to Montreal and visit my family and do my passport run in Canada instead of the UAE. Knowing that we were going to leave for long term travel in the summer, we decided to see incredible things within the UAE, including doing the longest zipline in the world in Ras Al Khaimah. We then escaped for a few weeks and flew to Laos to see the beautiful Kuang Si falls and discover another new country on our list together. The city of Luang Prabang is still relatively untouched and a must see. In April, we wanted to continue travelling together in Asia so we decided that although we have both already been to Bali separately that it would be nice to go back and create some memories there together. We spent a great time doing Bali from bottom to top and stayed at wonderful places during our stay in Ubud, Uluwatu, Seminyak, etc. Once we were back in Dubai, we had the travel bug again and had to organize a few weekend adventures within the UAE, including a luxurious stay at the Ritz-Carlton Al Wadi. Before I was meant to leave the country again, Mitch dragged us for another “vacay” within the country to discover the Al Maha Luxury Collection. It is a getaway that we strongly recommend you if you are coming to visit the UAE or even as a resident. The highlight of the month was that AdventureFaktory were honorable guests of the Nepal Tourism, where we brainstormed with other industry leaders about its tourism future. The trip was wonderful and I got to discover Pokhara on the occasion. It is something to be frequent traveller but another to actually be involved in developing tourism around the world with government entities. Mitch was stranded with work in Dubai, so I went alone unfortunately. We have been invited to join again for a conference in January 2019, but our month is all planned out. We are really sad as we love Nepal so much. We flew back the beginning of June back to Dubai where Mitch & I decided we had to visit another new country together before the end of the month. So we scrolled on FlyDubai and decided that Kuwait was ideal for the weekend. As much as we wanted to wander around the whole day, it was super hot and dry, so we made sure to schedule great wellness and gym time at the Four Seasons Burj Alshaya. 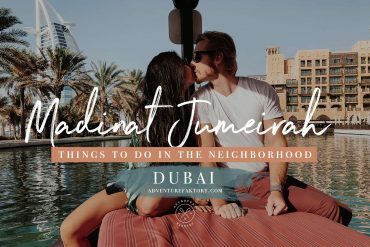 The city has so much more to do than first thought and it was easy to fill up a whole weekend exploring the markets, eating great food and exploring the corniche. Our big month arrived in July when Mitch finally finished work and we flew to London which was also my first time ever there! How odd was it that I’ve travelled to over 60 countries at that time and the UK was never part of that list! Actually before the major road trip we had planned, I barely had visited any western Europe countries other than France, Spain and Germany. So where to start about this month. If you didn’t know, we planned 6 months earlier that it would be a good idea to do our own version of the Mongol Rally and buy a car to drive from the UK to Mongolia. 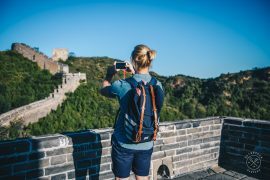 We changed slightly our itinerary to end the route in China. So pretty much after spending a week in London and getting our car the day before departure, on that Monday the 15th of July, we began with our friend Nick the road trip of our lives! We drove on the first day to France (through a ferry duh), to Belgium, Luxembourg and came back to spend the night in France. During that month of July, we drove through Germany, Liechtenstein, Switzerland, San Morino, Italy, Slovenia, Croatia, Serbia, Bosnia, Montenegro, Albania, Kosovo and Macedonia. 18 countries set foot on during that month… most people don’t even do that in a year or even in their lifetime! Following Macedonia, we drove to Greece, Turkey, Georgia, Armenia an Azerbaijan where we took the ferry through the Caspian sea to arrive in Kazakhstan. As soon as we landed in Kazakhstan, we raced to Uzbekistan where we probably enjoyed the most visiting during the trip, We spent over a week there before entering Tajikistan to drive on the famous route of the Pamir Highway through the Panj River where we literally drove for miles and miles side to side of the Afghani border. The road was was still going strong and we were seeing sites that hardly ever get seen. 🇹🇯 TAJIKISTAN 🇹🇯 🚙 UK 🔜 CHINA DRIVE 🚗 [ Day 48 ] ✖ We accomplished the #PamirHighway! Can’t believe this old boy @honda we got in the UK for 1500 Pounds got us this far! Crazy driving from @nickaronoff and Mitch and now we are currently in Osh, Kyrgyzstan, the starting town for many people that wants to do the trip of the Pamir Highway! This trip requires way more than 3 days but we literally raced through to make it for the World Nomad Games which we are proud to be member of the hosted media. Now let’s push it to Issyk-Kul 🇰🇬 . 🇹🇯 About this photo [ Day 46 ] The first day we left #Dushanbe to do the #PamirHighway, we decided to take the #wakhancorridor, which on that day we drove literally beside the Panj River that defines the border of Afghanistan and Tajikistan. Can’t believe we were that close and that we actually could’ve gone if we had 3 extra days! Maybe this will be for the next time when we drive the Wakhan valley from the Afghan side 😜🧐 For now, this will do for us being the closest to Afghanistan #AnyWhereAloha 🇦🇫 – 📷 @NikonMEA #D850 + 24-70mm AF-S Nikkor | See all our @Nikon shots on #AdventureWithNikon – 🇬🇧🔜🇨🇳 Road Trip Snaps on #AdventureFaktoryUnknownRoads + stories! 📸 More photos of 📍Tajikistan #AdventureFaktoryInTajikistan – 🗺 Travel guides & inspiration ➡ AdventureFaktory.com! After a crazy road trip in Tajikistan, we raced towards Kyrgyzstan to arrive on time for the opening ceremony of the World Nomad Games 2018 in the Northern lakes region of Kyrgyzstan. As hosted media, we had the mission to not only experience the culture, but attend unexpected sports events we’ve never seen in our lives before. It was such a highlight to be there and encounter things we’ve never experienced in the past. People from all over the world came here to celebrate these ancient games. 🇰🇬 KYRGYZSTAN 🇰🇬 The @WorldNomadGames are on and good news, @thuymi have been approved in the Uzbekistan team after a quick look at the accreditation😂 . 🏇🏼 On a serious note, we made it yesterday just in time for the great opening ceremony and today we went to see the wrestling, arm wrestling and Kok Boru, a very interesting sport where you throw a sheep in a goal. Note that the players are riding a horse too 😂 See all of that in the stories! So far, fun #WNG2018 🇰🇬 – 📷 @NikonMEA #D850 + 24-70mm AF-S Nikkor | See all our @Nikon shots on #AdventureWithNikon – 🇬🇧🔜🇨🇳 Road Trip Snaps on #AdventureFaktoryUnknownRoads + stories! 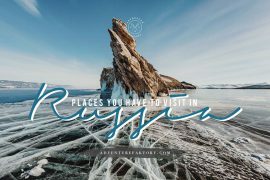 📸 More photos of 📍#Kyrgyzstan #AdventureFaktoryInKyrgyzstan – 🗺 Travel guides & inspiration ➡ AdventureFaktory.com! We then went back to Kazakhstan in Almaty to be able to find a buyer for our Honda CRV. As much as we wanted to drive to China, the country has strict rules for driving there so we had to change our plan. One day before our flight to China, we found a buyer, got rid of our car for 1000$US and flew to Russia for a connection to Urumqi in the western region of China. We spent a few days in the Xinjiang region to see what it was all about. Being there really opened our eyes towards the situation there with the Uighur community in China. As much as it is sad, being there really helped us spreading awareness about it to people we meet anywhere around the world, but we would absolutely avoid writing about it so our website doesn’t get banned for the Chinese internet surfers. After spending time in the western region of China, we went to Shanghai, one of the worlds mega-cities, the capital Beijing to see the Great Wall, Forbidden City and Tiananmen Square, Suzhou (where Mitch use to live before Viet Nam) and Anji, 4 hours away from Shanghai. We had to cut our Chinese trip short as we flew in Melbourne, Australia so Mitch could see his West Coast Eagles play in the Grand Final. Oh things we do for sports events around the world… And as luck would have it, they won by the narrowest of margins. Due to Mitch’s AFL detour in Australia, we spent the beginning of October in Melbourne and then flew over to Hong Kong to spend a week catching up with good friends. Again, we both went there separately previously but decided it would be nice to go together and eat all the Dim Sum we could. We fell in love with the efficiency and outdoor lifestyle of Hong Kong and its people and will definitely come back. We then flew to Ho Chi Minh City and stayed with our great friend James so Mitch can complete university courses for his Executive MBA. While I was munching on street food, Mitch sneaked out for a weekend in Kuala Lumpur to play in a AFL tournament in Asia, representing Laos, how odd?! 🇦🇺 MELBOURNE 🇦🇺 Currently at the @AFL grand final for the @westcoasteagles and tomorrow at the #CaulfieldRaces … sports weekend a quick flight away with @Qantas from Shanghai then we will be heading to Hong Kong… who will be around?! 🇭🇰. – 📷 @NikonMEA #D850 + 14-24mm AF-S Nikkor | See all our @Nikon shots on #AdventureWithNikon – 📸 More photos of 📍#Melbourne #AdventureFaktoryInAustralia – 🗺 Travel guides & inspiration ➡ AdventureFaktory.com! Coming back to Dubai hasn’t been very relaxing. For one of our clients EduOutings, we flew all the way to Buenos Aires to jump on a journey in Antarctica. It was such an amazing experience and a total honour to see the 7th continent. Another bucket list item ticked off of our list, yes, but it wasn’t just that, it was truly an experience that made us appreciate our planet even more and to do more about animal and environment protection. Antarctica has now been conquered. Coming back to Dubai we were able to catch up with friends and start planning our 2019 travels. December: Ending the year calmly after the storm year of 2018 ! This month has been quite stressful as we were both running around with work but also studies for Mitch. If you didn’t know it, Mitch is doing his Executive MBA at RMIT university in Melbourne and once in a while he has to fly back to Ho Chi Minh City, Vietnam to be able to take courses part of his degree. The beginning of December was exactly that, Mitch spent over 2 weeks in Vietnam to study non stop and barely had the time to eat all the yummy street food. I was meanwhile in the UAE recovering hard drive files and working on client’s projects while trying to fit in a few events here and there. On the 18th, literally a few days ago, we flew to Amsterdam where we currently are working on assignments and will find some time to walk around the city with the new Nikon Z7 to shoot. We will then head over Paris where we meet with his family and drive 4 hours away from the capital in an AirBnb in the region of Bourgogne (Burgundy) to spend some “down time”. Then for new years? We still don’t know where we will end up … welcome to our world ! That’s it! That was our 2018 year in review, in which we’ve set our feet in 35 countries plus our 7th continent Antarctica. What a year flying and driving around around the world. If I had time to go to Africa this year, I literally would’ve been to 7th continent in a single year, but that’s just a stupid personal record I decided it wasn’t worth pursuing. Speaking about Africa, this is definitely a goal for 2019 to see more of. Get ready for our 2019 bucket list soon!